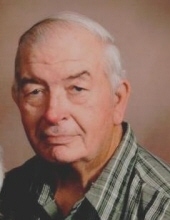 Richard H. Thelke, 77, of North Fond du Lac, died Sunday, January 27, 2019 at St. Agnes Hospital. He was born September 30, 1941. He attended Watertown High School. On May 17, 1963 he married Gloria Samuel. Richard drove truck for over 30 years until his retirement. He enjoyed camping at Evergreen Campsites in Wild Rose, Wisconsin and fishing, both in his boat, ice fishing, and sturgeon spearing. Richard took many trips to Canada with his camping friends and later enjoyed fishing for walleye in Put-in-Bay, Ohio with local buddies. He was a member of Eagles Aerie #270, North Fond du Lac Business Men’s Club, White Tails Unlimited, Wings Over Wisconsin, Rocky Mountain Elk Foundation, and Eagles Anglers Fishing Club. Richard enjoyed planting his garden and canning the produce. In his younger years he enjoyed playing baseball for the Rock River League. He played in North Fond du Lac’s Over 30 Softball League and also played softball for Evergreen Campsites. He is survived by his loving wife, Gloria; daughter, Kathryn Hilbert-Thelke; two grandchildren, Richard Jared “RJ” William Thelke and Samantha Rochelle Hilbert; his sister, Ruth Ann (David) Loppnow; two sisters-in-law, Jeanie (Roland) and Bonnie (Robert); nieces and nephews; special family friends, “Son” Kevin Wolfe and his daughter, Natalie, Stacy Warner, and many other dear friends who he considered family. The visitation will be held from 11:00 AM – 1:00 PM on Sunday, February 3, 2019 at Uecker-Witt Funeral Home, 524 N Park Avenue, Fond du Lac. The funeral service will be held at 1:00 PM on Sunday at the funeral home. Interment will take place at a later date in Ledgeview Memorial Park. To send flowers or a remembrance gift to the family of Richard H. Thelke, please visit our Tribute Store. "Email Address" would like to share the life celebration of Richard H. Thelke. Click on the "link" to go to share a favorite memory or leave a condolence message for the family.